PATRICK Payne reckons he absolutely loves Oakbank — and it’s clear his star jumper Zed Em does, too. The brilliant seven-year-old on Sunday claimed his second straight Thomas Foods Von Doussa Steeplechase crown with a typically dashing display in the $100,000 feature, held for the first time away from its traditional Easter Saturday timeslot. In front of an appreciative crowd of just over 3000, Zed Em, the $2.90 second favourite, was never headed after champion jumps jockey Steve Pateman sent him to the front with just over a lap to go. The gelding jumped sweetly then had plenty up his sleeve when challenged, holding a three-length advantage over Darren Weir’s Now and Zen ($11) at the end of the 3250m journey. It was Pateman’s fourth success in the Von Doussa after wins on Bello Signor (2006), the Payne-trained Lord Of The Song (2013) and Palmero (2014). The favourite Dormello Mo ($2.30) was third, another half-length back in one of the strongest Von Doussa line-ups in recent memory. The 2015 Von Doussa winner Nishiazabu crashed through the second-last fence but both horse and jockey Paul Hamblin escaped injury. Payne said Zed Em’s pure jumping ability gave him a significant edge on the Adelaide Hills circuit. “These tracks with real jumps suit him down to the ground because he’s just a real jumper,” the Victorian horseman said. “He’s a good jumper and he needs plenty of jumps. “He gets to a track like Sandown where there only two jumps in the last 1000m and he’s just not as effective. 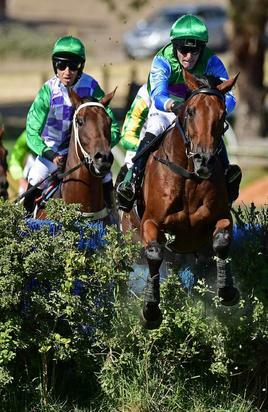 Payne said he was unsure if Zed Em would press on to the $160,000 Great Eastern Steeplechase (4950m), which this year will be run on Eastern Saturday instead of Easter Monday. He confirmed, however, that stablemate No Song No Supper, a solid fifth in the Von Doussa beaten just under 5½ lengths, was a definite Great Eastern starter. “Zed Em’s probably better in a race like the Brierly (at Warrnambool) but we’ll be open-minded about the Great Eastern,” he said. “He’s very well-weighted in the race. Oakbank Racing Club chairman Barney Gask said feedback on the club’s decision to revamp the Oakbank carnival had been very positive. “It has been an excellent day,” Gask said.